PARIS--(BUSINESS WIRE)--Drinking a Coca-Cola, any Coca-Cola, makes the moment special. At launch, 6 of the 10 spots will be released. The lead television spot, “Anthem,” (Mercado-McCann) comes to life through a series of ordinary moments linked by a Coca-Cola, such as ice-skating with friends, a first date, a first kiss, and a first love. The spot will run in all markets in 2016. The soundtrack to “Anthem” is an original song created for the campaign and titled “Taste the Feeling.” Coca-Cola worked with Music Dealers to source the song. In select markets, the song features the voice of newcomer Conrad Sewell. Sewell, a London-born, Australia-raised singer was featured in the breakout single “Firestone,” which produced 300 million Spotify streams and 3 million-plus worldwide sales. The anthem includes a new audio signature, inspired by the sounds of the experience of enjoying a Coca-Cola – the pop of the cap, the fizz, and ultimately the sounds of enjoyment. The new audio signature will be used throughout the campaign. Following a partnership that started in 2014, Coca-Cola has also tapped Avicii to produce a version of the “Taste the Feeling” campaign anthem featuring Conrad Sewell, and he will produce versions of the anthem for the UEFA EURO 2016TM and the Rio 2016 Olympic GamesTM campaigns. What is a Coca-Cola For?” (Sra. Rushmore), “Professor” (Sra. Rushmore), “Arctic Summer” (The Cyranos-McCann), “Empty Bottle” (Mercado-McCann), and “Real Enjoyment” (Mercado-McCann) will be released later in 2016. 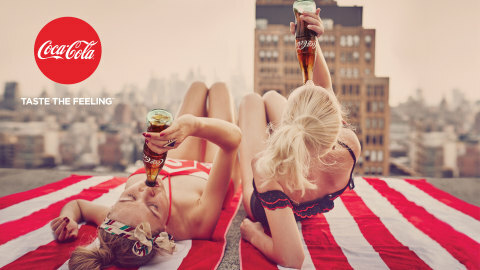 The new campaign features 100+ Campaign Images shot by noted fashion photographers Guy Aroch and Nacho Ricci capturing people from around the world enjoying ice-cold Coca-Cola in a variety of everyday moments. The new campaign imagery will be used in print advertising, out of home billboards, in-store as well as digital media.